Stay up to date on Groundwork Rhode Island’s work and successes by visiting our FACEBOOK PAGE! 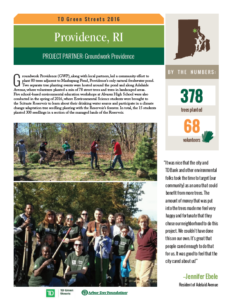 Groundwork RI planted 378 trees in communities in Providence in 2016! The armory is the home of the industrial revolution in North America, a most fitting place to continue the discussion on where the RI economy is heading and how we can improve its condition. This conference is the brain child of Greg Gerritt, a member of the Board of Directors of Groundwork Providence. It will bring together many of the leading thinkers in Rhode Island to discuss the centrality of Environmental Justice in the development of an economy that creates community prosperity. Early registration is encouraged. Single tickets for the conference are $35, going up to $40 on September 15. Greg is happy to answer any questions you have. There is also a separate admission dinner/dance party immediately following–please ask for details. Conference Format: short presentations followed by discussion. Additional speakers are being sought. Suggest one. If you are registering, please state your intent to register and attend the October 12 conference in the email. Payment should be made to the Environmental Justice League of Rhode Island. If you would like to pay online, you can do so using google checks at http://ejlri.wordpress.com/donate-now/ Other forms of payment can be arranged by email. I am a Rhode Island native, studied Anthropology at RIC, and have spent that past 7 years volunteering and educating myself around environmental issues. I returned to RI this past spring and was recommended to apply for the Green Team Supervisor job by a friend and previous GT Supervisor. As an environmentalist with a passion for food justice I was excited to share and encourage community and environmental stewardship with my Green Team. We learned so much from each other and had a great summer. I was lucky to work with such a bright and ambitious group of teens and look forward to continuing in that direction. I like to think I will take away from this experience a renewed sense of what my strengths are and how to channel them to be an enthusiastic and valuable member of my community. Green Team 2013 worked with three major community partners this summer. At Miriam Hospital we learned about the recycling challenges that hospitals all over the country are facing and focused on an important material called Blue Wrap that is used every day to protect sterilized instruments in the OR. Miriam has taken the initiative in RI to establish a recycling plan for the material, and we helped by baling the blue wrap to prep it for transport. We collaborated with Roger Williams National Memorial and worked alongside their maintenance crew to keep the grounds in good shape by edging pathways, pulling weeds, painting picnic tables and looking after the demonstration gardens. The Green Team also put together an informative pamphlet regarding the Speakers Corner that was installed by last year’s Green Team in collaboration with the Steel Yard’s Camp Metal Head and the Parks Service. We also spent a portion of time working with Diana, a community member and visionary, at a pocket park named “The Wild.” The park is sandwiched between Collyer Field and the Peter Pan Bus Station. The area was overgrown with invasive species and is slowly being transformed into a tranquil refuge for passersby and those waiting for the bus. Since its inception, numerous community members have lent a hand to the project and left their imprint. The Green Team helped by removing knotweed, cutting down trees, planting bushes, building a stone path, mulching, and watering. The team supported many other projects: knocking down knotweed with Greg Gerritt on the Collyer Field Forest Restoration project, mulching trees with Ray Perreault at the Whole Foods Plot in North Burial Ground, and gardening at the Mt Hope Learning Center to name a few. Enrichment opportunities included tours at the Fertile Underground shop and gardens, focusing on education around food issues such as health and nutrition, and the economic and political factors as well. At the edible gardens at Dexter Field, the Green Team assisted Community Outreach Coordinator Dauna and helped install protective structures around the garden. Save the Bay gave us a tour of the harbor where we learned how vital it is to our economy and well being. We toured their Green Building that exemplifies the many steps you can take to green your surroundings and the overall economic and environmental benefits. The summer came to a close on August 22nd when the Green Team gave a final presentation at the Speakers Corner located in the Roger Williams National Memorial. The group outlined the many collaborations and projects they undertook over the summer highlighting what they learned and how they benefited from the program. Teamwork, patience, and discovering new plants and how to care for and use them are a few of the things they will walk away with after their summer at Groundwork. With a new point of view Nia Monteiro added that “now I can see the potential for beauty in rundown, neglected spaces.” James Monteiro ended the presentation on the realization that “every small thing you do really does effect a bigger picture,” and that they have made a lasting contribution to their community. PROVIDENCE, RI — Senator Jack Reed will arrive at the Groundwork Providence Community Garden at 14 Ring Street at 1:30 PM on Friday, August 2, 2013 for a ceremony of appreciation. After, he will visit the Hope Tree Nursery at 69 Sprague Street, Providence. Senator Reed obtained a Department of Labor job training grant in 2009-2010 in the amount of $175,000 for Groundwork Providence. The grant sustained the organization and allowed it to complete its Community Garden on Federal Hill and the Hope Tree Nursery among other projects. Groundwork Providence, a non-profit organization based in Providence, Rhode Island dedicated to building a cleaner, safer, greener and more beautiful Capitol City for the State of Rhode Island, converted a former vacant parking lot on Federal Hill into one of the most dynamic outdoor green spaces and urban ecology teaching centers in the city. Also in the past two years, Groundwork Providence created the Hope Tree Nursery at 69 Sprague Street in Providence. The 4500 square foot nursery was constructed on a brownfield, which is a parcel of land with contaminants from former industrial uses. Groundwork Providence personnel brought water onto the site, placed an 18 inch cap on soil contaminated with lead and built a retaining wall and fence around the nursery. The nursery is designed to produce low-cost native trees for the city’s least forested neighborhoods and grow trees in the urban environment. The nursery helps eliminate the expense of buying and transporting trees grown in nurseries as far away as Oregon. The seedlings are divided among 20 native and diverse species and total 280 overall. The trees are in a pot-in pot nursery system, which allows the easily replacement of seedlings after they mature and are planted. The trees will be sold for cost at a price which self-sustains the nursery financially. Groundwork Providence is the first in the nation to implement and test this innovative environmental and economic model. PROVIDENCE, RI — Cluck! has earned the exclamation point at the end of its name. George Harvey and his team from Groundwork Providence, a nonprofit dedicated to building a cleaner, safer and greener capital city, went to work July 22 at Cluck! to remove a sizable portion of its paved parking lot. Although the city’s zoning ordinances require Cluck! to have three off-street parking spots, the new business will not provide any more than required by law. It will instead use the remaining space that was once paved for stormwater mitigation by planting several tupelo and shade trees. Close followers of this story will recall that Providence’s zoning restrictions were an obstruction during the initial zoning process, almost derailing the business, which had already done tens of thousands of dollars of improvements to the abandoned gas station at 399 Broadway, before it even opened. Groundwork Providence has been doing similar work in Pawtucket, Woonsocket and Central Falls, due in large part to funding from the Environmental Protection Agency (EPA). Twelve percent of Rhode Island, the country’s second-densest state after New Jersey, is covered by impervious surfaces such as parking lots, roads, roofs and concrete. Much of the pollution in Narragansett Bay washes in from paved-over surfaces. The problem has reached comic proportions. A study published earlier this year noted that Rhode Island’s top location for Craigslist “missed connections” was parking lots, putting it at odds with neighboring Massachusetts, where a plurality of missed connections happen on the MBTA. Although Tennessee listed its No. 1 location as Walmart, many states such as Massachusetts, New York, New Jersey, Oregon and Washington listed public transportation as their No. 1 location, according to the study. Cluck! owner, Drake Patten, who holds a master’s degree in archeology, said the process of removing the asphalt reminded her of digs she had been on. At the University of Virginia, she removed many layers of a road, seeing the various surfaces — concrete, asphalt and cobblestone — that had been popular at different stages in history. She noted that macadam — a collection of gravel with a binder, similar but more permeable than today’s asphalt — had held together the best through the years. While other layers were destroyed in part or whole by the elements, the macadam layer was intact. Patten mused about a day in which the on-street parking spots on Broadway might be simple gravel, with only the street and bike lanes paved. Pawtucket Foundation and Anchor Recovery Community Center set to oversee tree care. PAWTUCKET, RI–Friday, June 28, 2013 –Eight volunteers from the Pawtucket Anchor Recovery Community Center participated in a tree care training session led by Groundwork Providence’s Director of Field Operations, George Harvey. The event marked the commencement of a partnership between Anchor, the Pawtucket Foundation and the City of Pawtucket to provide the necessary maintenance for the trees in the twenty-two planters that line the sidewalks of Main Street. The trees, planted by Groundwork Providence, were installed as part of a Main Street Enhancement project led by the Pawtucket Foundation and area businesses. After the classroom discussion, the group ventured outside to participate in hands-on training. Volunteers, sporting reflective orange safety vests customized with the Anchor and Experience Pawtucket logos, practiced trimming and shaping the trees for optimal and healthy growth. The volunteers spent the rest of the session learning how to use the two newly acquired, battery-operated watering carts to properly water the planters. Before leaving, volunteers were informed of opportunities to join the Adult Job Training program offered by Groundwork Providence. The watering carts and safety vests were purchased as part of the Main Street Streetscape Enhancement Project initiated by downtown residents, business owners and the Pawtucket Foundation. The group was awarded a $50,000 Community Development Block Grant to beautify and revitalize the central core of Main Street. As the fiscal agent and project manager, the Pawtucket Foundation helped facilitate the design, purchase and installation of customized bike racks, trashcan enclosures, planters and Experience Pawtucket banners. Anchor volunteers will water the trees three times a week, sweep the sidewalks and remove debris in an effort to preserve and maintain the urban environment. While Anchor volunteers have successfully taken on these responsibilities for the past month, the training session marked the formal inauguration of the partnership. The training session was paid for with private funds from the Pawtucket Foundation and Shri Studios. The Pawtucket Foundation will continue to privately contract Groundwork Providence for biannual check-ins and elevated tree care. This program is a follow up and update on Champions in Action grantee, Groundwork Providence. Guests describe the improvements made as a result of receiving the Champions in Action grant from Citizens Bank and the benefits of promotional work performed by WJAR NBC 10, a Champions in Action partner. They note expansion of various outreach; volunteer; environmental job training and skill development programs. Guests share photos of before and after the upgrades made to the Community Garden site and other facilities. To showcase these improvements, their first Fundraising Event and the first Rain Barrel Sale will be held in the Community Garden site. For more information, visit the GWP’s Events Page. A collaboration by Jorge Alvarez High School (Class of 2013) AP Environmental Science students, Environmental Justice League of Rhode Island, and Urban Pond Procession. The film discusses the history and future of Mashapaug Pond and its effects on both the school and the surrounding communities. There’s no question that planting 40,000 trees across Providence and improving the landscapes of the city’s struggling neighborhoods within the next decade are ambitious goals. Fortunately, Groundwork Providence is up to the task. Established nearly 30 years ago as Keep Providence Beautiful, Groundwork Providence has evolved beyond its clean-up efforts, extending into education and training programs. One of the primary focuses of Groundwork Providence is to clean up and beautify underutilized and previously polluted parcels of land. In doing so, the organization aims to reconnect the fabric of urban neighborhoods while providing space where people can grow their own food and learn about the environment. Dubbed the Groundwork Garden, the design and construction of the space is done by at-risk adults participating in the organization’s job-training program. Having secured federal funds through the EPA Environmental Workforce Job-Training grant, Groundwork Providence conducts 12-week trainings twice a year, targeting individuals with limited career opportunities in Providence, Central Falls, Pawtucket and Woonsocket. Now in its third year, the program’s curriculum centers on identifying the needs of the employer community to include certifications in hazardous waste operations, construction safety, CPR/First Aid, lead and asbestos abatement, indoor air quality and underground storage tank inspection and maintenance. This is combined with 60 hours of classroom training from some of New England’s leading experts on environmental science, storm water management, brownfields revitalization, tree care and horticulture, and more. The Groundwork Garden is a hub for the Providence Community Growers’ Network, one of six sites in Providence that serve as distribution centers for gardening materials and host community events. It will house the soon-to-be-completed outdoor Ecolab, which will hold educational workshops for farmers of all levels and ages. Representing what may be Groundwork Providence’s most ambitious initiative is Trees 2020. Developed in 2008 in partnership with Doug Still, Providence’s City Forester, the program addresses the lack of residential tree planning in the city. Funded by the Helen Walker Raleigh Tree Care Trust Fund of the R.I. Foundation, it aims to increase Providence’s tree coverage by 30 percent by 2020. To accomplish this, Groundwork Providence is working with the Providence Neighborhood Planting Program to leverage the planting of 40,000 new trees by homeowners, land-owning institutions and the city of Providence. By securing and supplying trees at minimal cost to Providence residents, the program is successfully increasing the urban tree canopy in some of the city’s most in-need neighborhoods. To date, nearly 10,000 trees have been put in the ground, and the benefits are substantial. “With greater tree coverage, daytime temperatures in the summer decrease due to shade, air pollution is filtered, storm water overflow is reduced and winter winds are slowed, which can have a direct impact on the reduction of heating costs. Overall, these neighborhoods can experience an improved quality of life where additional tree canopy thrives,” Lupoli explained. To further support Trees 2020, Groundwork Providence recently completed its new Hope Tree Nursery, built by the organization’s GroundCorp program – a social venture initiative that offers landscape design-build and maintenance services. The program provides paid, hands-on experience to graduates of Groundwork’s job-training program as individuals seek permanent environmental work. As a rapidly growing organization, Groundwork Providence is looking to grow its team of volunteers. According to Lupoli, the best way to get involved is to participate in a tree planting; events are regularly posted to their website at www. GroundworkProvidence.org. Volunteers are often needed to assist with administrative tasks. “While there’s often a lot of interest in our work around Arbor Day and Earth Day in April, we’re always in need of volunteers. Our efforts, both with planting and especially around education, are year-round,” says Lupoli. Entirely funded by grants and donations, Groundwork Providence offers local businesses and individuals a variety of ways to support its work. Every donated dollar the organization receives or earns through its GroundCorp venture goes directly into its programs. Along with accepting donations by cash and check, donors have the option to make a gift online through Groundwork’s website. The organization also accepts donated tools, gardening equipment, building materials and planting mediums. “Each of us at Groundwork Providence live in the city and take immense pride in the community and our unique opportunities to initiate changes,” said Lupoli. “Our hope is to continue growing as a valuable resource and build partnerships with other organizations that share our aspirations for a more beautiful capital city – it’s all about creating positive change from ‘the ground up.’” For more information on Groundwork Providence, visit www.GroundworkProvidence.org or contact Sheri Lupoli at 351-6440 ext. 15. In Providence, Rhode Island, on the site of a former factory, an urban nursery is helping make the whole city more green. Hope Tree Nursery is the first financially self-sustaining nursery constructed on a brownfield in the United States. The site was once home to the Rau Fastener Company on Sprague Street, southwest of Downtown Providence.Years of producing metal fasteners left the site contaminated with heavy metals and today, Sprague Street is part of an economically distressed community lacking green space. Known as a “legacy city,” the area is characterized by the vestiges of a past, productive era. 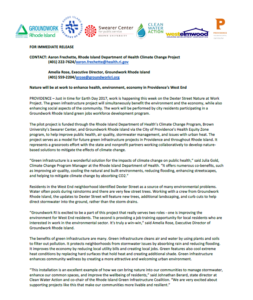 The project is spearheaded by Groundworks Providence and its partners, who hope a nursery will provide much needed green space to the area and increase the tree canopy while involving the larger community in remediation efforts. Supported by the City of Providence and Trees 2020, the Hope Tree Nursery’s partners aim to foster environmental change and community development by encouraging community groups and local residents to become involved in the nursery. The project has significant economic benefits, too. A 2008 study by the City of Providence found that the city was paid back $3.33 annually for every dollar spent on planting trees. By improving public health and increasing property values, Groundwork Providence envisions the nursery to have impacts far outside its fences. A grant from the Environmental Protection Agency’s Brownfields Program provided the initial, assessment of the Sprague Street site’s contamination. Left vacant for years after the assessment, Groundwork Providence came into possession of 4,500 sq.ft. of the site through a generous annual lease of $1 from Rhode Island Housing. Today the Nursey is thriving, and Groundwork Providence recognized an opportunity for even broader economic impact. The organization has trained local residents in environmental remediation, and used the Nursery as a living classroom. This aspect of the program was made possible by the EPA’s Brownfields Job Training Program, and facilitated the project’s development by enabling communities to invest in their futures. The Hope Tree Nursery shows how federal support can help breathe new life into cherished yet blighted sites. The BUILD Act will help communities make lasting, positive change in places like Providence and across the country. The Hope Tree Nursery will be a community asset to Providence, and plant the seeds of change in a economically challenged community. The project is a stellar template for the potential of brownfields redevelopment across Rhode Island and the country. A new bill in Congress could help more communities invest in projects like the Hope Tree Nursery. The Brownfields Utilization, Investment, and Local Development (BUILD) Act, introduced in early March, will make more projects like this possible. The BUILD Act would help communities to redevelop contaminated and abandoned sites that inhibit economic development and pose risks to public health. The legislation would reauthorize the EPA’s Brownfields Program, an essential part of the Hope Tree Nursery’s success. Voice your support for the BUILD Act: Send a letter to your Senators today. Groundwork Providence is the newest Champions in Action grantee. Sheri Lupoli introduces us to Groundwork Providence and its important community based programs. We also meet the Champions in Action Partners, NBC 10, represented by Mario Hilario, and Citizens Bank-RI, represented by Ned Handy. Citizens bank is the grantor and NBC 10 in the media partner in this ten-year community strengthening initiative. Visit their websites for more information about each program. “State of the State” is a Rhode Island public access television show produced by John Carlevale. The purpose of this show is to promote, in a non-partisan manner, the civic awareness of the general public; to promote greater civic participation and the exercise of political citizenship by using the television show as a means to educate and inform. State of the Sttae has been continuously produced and broadcast on public access television since 1991. PROVIDENCE, R.I. (January 29, 2013) – Earlier today, Citizens Bank and NBC 10 named Groundwork Providence as the first 2013 Champion in Action® in the category of strengthening communities. Groundwork Providence will receive a $35,000 unrestricted grant, media coverage, and extensive promotional and volunteer support for its outstanding work. Groundwork Providence began as Keep Providence Beautiful in 1983. In 2000, the organization joined the Groundwork USA network to develop and utilize the latest techniques in new urbanism to revitalize neighborhoods experiencing joblessness and lack of green space. The grant will be used to complete an outdoor eco-laboratory and teaching facility at its community garden and create jobs in a growing green economy through teaching and educational programs for trainees, students and residents. Launched in 2002, Champions in Action is a joint initiative of Citizens Bank and NBC 10 to recognize and support nonprofit organizations for their contributions to Rhode Island communities. To date, the program has awarded 40 nonprofits more than $1 million in grants and promotional support in Rhode Island. Groundwork Providence provides a wide array of programs, including: Groundcorps, its job-training social venture program; Green Teams, a summer youth program, that fosters citizenship and civic participation; and the remediation of urban space to eliminate blight and promote environmental stewardship. Exposure on both Citizens Bank and NBC 10 websites. For more information about the Citizens Bank / NBC 10 Champions in Action program, visit www.citizensbank.com/community/champions or www.turnto10.com. To learn more about how to contribute to Groundwork Providence through donations or volunteerism, call 401.351.6440 or visit http://www.groundworkprovidence.org . 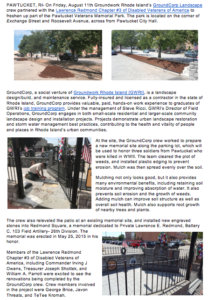 About Groundwork Providence – Groundwork Providence (GWP) is a non-profit organization based in Providence, Rhode Island dedicated to building a cleaner, safer, greener and more beautiful capital city. Its mission is to foster and awaken the potential of neighborhoods by working in conjunction with residents and businesses to improve the physical environment in economically struggling neighborhoods. GWP activates and beautifies underutilized, polluted parcels, providing places where people can grow their own food and learn about stewardship of the environment. GWP targets chronically unemployed populations and provides them with job training in storm water management and the remediation of brownfields. GWP is also working with the city of Providence to plant 40,000 new trees, creating a true urban forest. About Citizens Bank – Citizens Bank is a division of RBS Citizens, N.A., operating its seven-state branch network in Connecticut, Delaware, Massachusetts, New Hampshire, New York, Rhode Island and Vermont. It has 83 branches and 192 ATMs in Rhode Island. RBS Citizens, N.A., is a subsidiary of RBS Citizens Financial Group, Inc., a $132 billion commercial bank holding company. It is headquartered in Providence, R.I., and through its subsidiaries has more than 1,400 branches, approximately 3,600 ATMs and approximately 18,950 colleagues. Its two bank subsidiaries are RBS Citizens, N.A., and Citizens Bank of Pennsylvania. They operate a 12-state branch network under the Citizens Bank brand in Connecticut, Delaware, Massachusetts, New Hampshire, New Jersey, New York, Pennsylvania, Rhode Island and Vermont; and the Charter One brand in Illinois, Michigan and Ohio. RBSCFG has non-branch retail and commercial offices in more than 30 states. RBSCFG is owned by RBS (the Royal Bank of Scotland Group plc). RBSCFG’s website is citizensbank.com. – WJAR-TV/DT is the most-watched television station in the Providence-New Bedford market, and NBC 10 News is southern New England’s leading news station. WJAR was first launched as a radio station in 1922 and then became the market’s first television station in 1949. WJAR-TV/DT is owned by Media General, Inc.
(Boston, Mass. – July 3, 2012) – EPA is providing a total of $317,000 to three Rhode Island organizations. One grant will provide job training for environmental work, and two grants will help address urban water quality issues, all of which will contribute to cleaner, healthier communities. Under EPA’s Brownfields “Environmental Workforce Development and Job Training” program, a $200,000 EPA grant will assist Groundwork Providence to train 54 students, and place at least 45 graduates in environmental jobs. Groundwork Providence will track graduates for at least one year to assist students’ transition to the workforce. The training program includes 40-hour HAZWOPER, Underground Storage Tank leak prevention, solid waste management and recycling, wastewater management, lead abatement supervisor, innovative treatment technologies, construction safety and innovative technologies for water issues. In addition, supplemental training in integrated pest management, wastewater treatment operator, or underground storage tank operator will be offered to select students. Participants who complete the core training program will earn six state or federal certifications. Groundwork Providence is targeting unemployed and underemployed residents of Providence, Woonsocket, Central Falls, and Pawtucket, and will partner with the Providence Housing Authority, Workforce Solutions of Providence/Cranston, Family Success Centers, and the West Elmwood Housing Corp. Since 1998, EPA has awarded more than $42 million nationally under the Environmental Workforce Development and Job Training program. As of June 2012, approximately 10,300 individuals had completed training and approximately 7,300 obtained employment in the environmental field, with an average starting hourly wage of $14.12. The development of this green workforce will allow the trainees to develop skills that will make them competitive in the construction and redevelopment fields. Graduates of the program are equipped with skills and certifications in various environmental fields including lead and asbestos abatement, environmental site sampling, construction and demolition debris recycling, underground storage tank removal, ecological restoration, and green building techniques. Graduates use these skills to improve the environment and people’s health while supporting economic development in their communities.